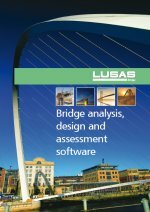 LUSAS Bridge has a host of easy to use results processing and viewing facilities to help you get the most from your analysis. Results for all or selected parts of a model can be viewed using separate layers for diagram, contour, vector and discrete value data. Loadcases are selected on a window basis allowing multiple views of the model with each window displaying results for different loadcases. Basic load combinations allow for manual definition of loadcases to be included and load factors to be used. Envelopes of multiple loadcases provide maximum and minimum results. Smart Combinations generate maximum and minimum results, taking account of adverse and relieving effects, substantially reducing the number of combinations and envelopes required. Bending moments, shear forces, and deflections can be plotted. Contour ranges and vector/diagram scales can be controlled locally in each window or set globally to apply to all windows. Results can be plotted on deformed or undeformed mesh plots and on fleshed or unfleshed beam sections. Multiple slices may be cut through 3D solid models on arbitrary planes and made visible or invisible in any window. Results can be selectively output to spreadsheet applications for additional calculation and graphing uses. For concrete modelling, plotting of crack width contours and values can be carried out for supported design codes by a variety of means. Inspection locations provide the means to obtain results for user-defined positions of interest on a model. 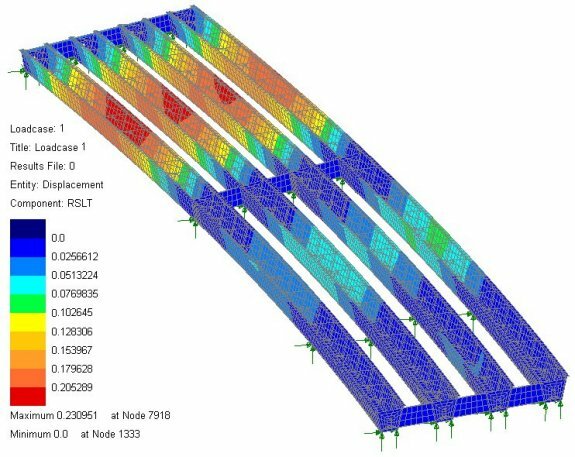 The reinforced concrete slab design facility supports plotting of contours and values that indicate flexural reinforcement requirements at Ultimate Limit State (ULS) or design crack width at Serviceability Limit State (SLS) for design codes that support this. Calculations carried out are for reinforced concrete slabs (without prestressing) that are modelled using plate or shell elements. For ULS, both bending only (using Wood-Armer), and bending and in-plane effects (using Clark-Nielsen) can be considered. For SLS, both bending-only (using principal moments), and bending and in-plane effects (using principal stresses) can be considered, if supported by a chosen design code. Reinforcement arrangements are defined using RC slab design attributes. Multiple slab design attributes may be defined and assigned to relevant features on a model. Values and results contours for a chosen results component can be displayed for a stated slab face and for a previously chosen Code of Practice using standard values and contour plotting facilities. An in-built user-defined results calculation facility allows LUSAS model and results parameters to be used in arithmetic expressions to give spreadsheet-style capabilities inside all LUSAS software products. It offers an alternative to external results manipulation. However, unlike external spreadsheet calculations, because all calculations are done inside LUSAS and based upon current model and results data, the values obtained can be automatically be recalculated at the press of a button if the model data is edited or if results change. Animations of results - particularly useful for animating mode shapes, viewing of structural response to moving loads and seismic events, and for investigating the spread of concrete cracking or yielded material - can be created and saved as AVI files for use in other Windows applications. A graph wizard provides a step by step means of selecting results data to be drawn on a graph. Numerical data used to create the graph is displayed in a grid format alongside. Arbitrary line sections may also be taken through any surface model or on a slice cut through a three-dimensional solid model. Camber, displacement history, and incremental displacement results tables can be produced for selected model locations to assist staged construction work. Results values for individual results components and entities can be tabulated using the Print Results wizard. These may be transferred to other applications using standard Windows copy and paste operations. Model and results views can be printed directly, saved as high resolution BMP, JPG, or WMF files, or be copied and pasted direct into other applications. One-click reports can be created for selected members, and general modelling, loadcase and results data can be selected on an element, feature type, group, and loadcase basis for inclusion in a main report. Screenshots, saved images, graphs and one-click reports can also be included. Each time a report is created, up-to-date modelling and results data is used to ensure compatibility at all times. Report data may be exported to Excel spreadsheets as well as be exported into other formats including PDF, HTML and RTF (for use in Word) for quality assurance, model checking, and results listing purposes. The contents of a model window can be saved or copied for use in creating reports in applications such as MS Word. All results can be output for use in spreadsheet applications such as MS Excel where additional graphing or calculations can be carried out.